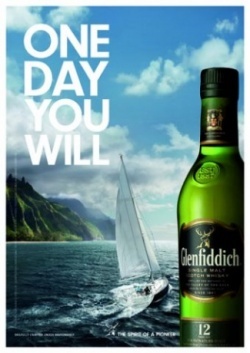 A new global advertising campaign for single malt Glenfiddich is set to roll out in the coming weeks. The ‘One Day you Will’ campaign will run include relationship marketing, digital, social media and PR, including both lifestyle and tasting note executions, alongside the call-to-action aiming to encourage consumers to make the most of life’s adventures. The creative features scenarios which look to inspire awe, including a sailing boat on open water and a mountainous landscape with two men looking out to the distance.